Maxum’s 3500 SCR stands out for contemporary styling, roomy accommodation and solid construction. The wide beam and absence of side decks allows a more expansive interior, giving the 3500 the feel of a larger boat below decks. As an express-style boat, a great deal of attention has been paid to above deck amenities. The helm and cockpit areas together form a large continuous space with comfortable seating areas and a handy, well-equipped refreshment centre. Below decks are two separate sleeping areas, a lounge area, a full service galley with all the features you would expect and amazing storage in every area of the boat ... the galley has a huge lazy susan tucked in the corner cupboard! This Great Lakes, freshwater express with Mercruiser 454 inboards has logged only 700 hours since new. 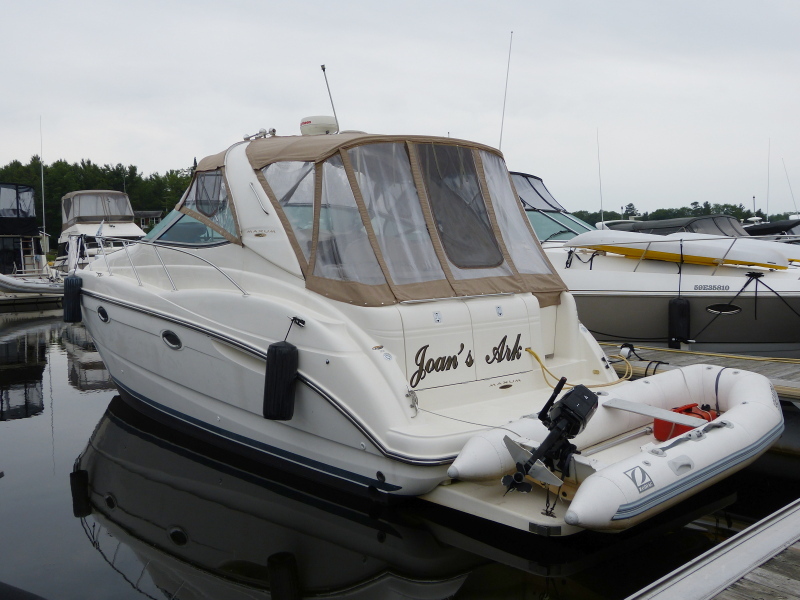 With a complete canvas system replacement in 2014, she is ready for many more years of cruising enjoyment at a very affordable price point. A recent survey (May, 2015) is available for review upon request.